Zidovudine, one of the 2 active ingredients in lamivudine and zidovudine tablets, has been associated with hematologic toxicity including neutropenia and anemia, particularly in patientswith advanced HIV-1 disease[see Warnings and Precautions (5.1)]. Prolonged use of zidovudine has been associated with symptomatic myopathy [see Warnings and Precautions (5.2)]. Lactic acidosis and hepatomegaly with steatosis, including fatal cases, have been reported with the use of nucleoside analogues alone or in combination, including lamivudine, zidovudine, and other antiretrovirals. Suspend treatment if clinical or laboratory findings suggestive of lactic acidosis or pronounced hepatotoxicity occur [see Warnings and Precautions (5.3)]. Acute exacerbations of hepatitis B have been reported in patients who are co-infected with hepatitis B virus (HBV) and HIV-1 and have discontinued lamivudine, which is one component of lamivudine and zidovudine tablets. Hepatic function should be monitored closely with both clinical and laboratory follow-up for at least several months in patients who discontinue lamivudine and zidovudine tablets and are co-infected with HIV-1 and HBV. If appropriate, initiation of anti-hepatitis B therapy may be warranted [see Warnings and Precautions (5.4)]. These highlights do not include all the information needed to use lamivudine and zidovudine tablets USP safely and effectively. See full prescribing information for lamivudine and zidovudine tablets USP. Immune reconstitution syndrome (5.8) and redistribution/accumulation of body fat (5.9) have been reported in patients treated with combination antiretroviral therapy. To report SUSPECTED ADVERSE REACTIONS, contact TEVA USA, PHARMACOVIGILANCE at 1-888-838-2872, X6351 or drug.safety@tevausa.com; or FDA at 1-800-FDA-1088 or www.fda.gov/medwatch. Concomitant use with the following drugs should be avoided: stavudine (7.1), zalcitabine (7.1), doxorubicin (7.2). Lamivudine and zidovudine tablets, a combination of two nucleoside analogues, are indicated in combination with other antiretrovirals for the treatment of HIV-1 infection. The recommended oral dose of lamivudine and zidovudine tablets USP in HIV-1-infected adults and adolescents weighing greater than or equal to 30 kg is 1 tablet (containing 150 mg of lamivudine and 300 mg of zidovudine) twice daily. The recommended oral dosage of scored lamivudine and zidovudine tablets USP for pediatric patients who weigh greater than or equal to 30 kg and for whom a solid oral dosage form is appropriate is 1 tablet administered twice daily. Before prescribing lamivudine and zidovudine tablets USP, children should be assessed for the ability to swallow tablets. If a child is unable to reliably swallow a lamivudine and zidovudine tablet USP, the liquid oral formulations should be prescribed: EPIVIR® (lamivudine) Oral Solution and RETROVIR® (zidovudine) Syrup. Because lamivudine and zidovudine tablets USP are a fixed-dose combination tablet, they should not be prescribed for pediatric patients weighing less than 30 kg or patients requiring dosage adjustment, such as those with reduced renal function (creatinine clearance less than 50 mL/min), patients with hepatic impairment, or patients experiencing dose-limiting adverse reactions. Liquid and solid oral formulations of the individual components of lamivudine and zidovudine tablets USP are available for these populations. Lamivudine and zidovudine tablets USP are white, scored, film-coated, convex, oval tablets, debossed on both tablet faces, such that when broken in half, the full "TVL2" code is present on both halves of the tablet ("TV" on one face and "L2" on the opposite face of the tablet). Lamivudine and zidovudine tablets are contraindicated in patients with previously demonstrated clinically significant hypersensitivity (e.g., anaphylaxis, Stevens-Johnson syndrome) to any of the components of the product. Zidovudine, a component of lamivudine and zidovudine tablets, has been associated with hematologic toxicity including neutropenia and anemia, particularly in patients with advanced HIV-1 disease. Lamivudine and zidovudine tablets should be used with caution in patients who have bone marrow compromise evidenced by granulocyte count less than 1,000 cells/mm3 or hemoglobin less than 9.5 g/dL [see Adverse Reactions (6.1)]. Frequent blood counts are strongly recommended in patients with advanced HIV-1 disease who are treated with lamivudine and zidovudine tablets. Periodic blood counts are recommended for other HIV-1-infected patients. If anemia or neutropenia develops, dosage interruption may be needed. Myopathy and myositis, with pathological changes similar to that produced by HIV-1 disease, have been associated with prolonged use of zidovudine, and therefore may occur with therapy with lamivudine and zidovudine tablets. Lactic acidosis and hepatomegaly with steatosis, including fatal cases, have been reported with the use of nucleoside analogues alone or in combination, including lamivudine, zidovudine, and other antiretrovirals. A majority of these cases have been in women. Obesity and prolonged nucleoside exposure may be risk factors. Particular caution should be exercised when administering lamivudine and zidovudine tablets to any patient with known risk factors for liver disease; however, cases have also been reported in patients with no known risk factors. Treatment with lamivudine and zidovudine tablets should be suspended in any patient who develops clinical or laboratory findings suggestive of lactic acidosis or pronounced hepatotoxicity (which may include hepatomegaly and steatosis even in the absence of marked transaminase elevations). Posttreatment Exacerbations of Hepatitis: In clinical trials in non-HIV-1-infected patients treated with lamivudine for chronic HBV, clinical and laboratory evidence of exacerbations of hepatitis have occurred after discontinuation of lamivudine. These exacerbations have been detected primarily by serum ALT elevations in addition to re-emergence of hepatitis B viral DNA (HBV DNA). Although most events appear to have been self-limited, fatalities have been reported in some cases. Similar events have been reported from postmarketing experience after changes from lamivudine-containing HIV-1 treatment regimens to non-lamivudine-containing regimens in patients infected with both HIV-1 and HBV. The causal relationship to discontinuation of lamivudine treatment is unknown. Patients should be closely monitored with both clinical and laboratory follow-up for at least several months after stopping treatment. There is insufficient evidence to determine whether re-initiation of lamivudine alters the course of posttreatment exacerbations of hepatitis. Important Differences Among Lamivudine-Containing Products: Lamivudine and zidovudine tablets contain a higher dose of the same active ingredient (lamivudine) than EPIVIR-HBV® (lamivudine) Tablets and Oral Solution. EPIVIR-HBV® was developed for treating chronic hepatitis B. Safety and efficacy of lamivudine have not been established for treatment of chronic hepatitis B in patients co-infected with HIV-1 and HBV. Emergence of Lamivudine-Resistant HBV: In non-HIV-infected patients treated with lamivudine for chronic hepatitis B, emergence of lamivudine-resistant HBV has been detected and has been associated with diminished treatment response (see full prescribing information for EPIVIR-HBV® for additional information). Emergence of hepatitis B virus variants associated with resistance to lamivudine has also been reported in HIV-1-infected patients who have received lamivudine-containing antiretroviral regimens in the presence of concurrent infection with hepatitis B virus. Lamivudine and zidovudine tablets are a fixed-dose combination of lamivudine and zidovudine. Lamivudine and zidovudine tablets should not be administered concomitantly with other lamivudine- or zidovudine-containing products including EPIVIR® (lamivudine) Tablets and Oral Solution, EPIVIR-HBV® Tablets and Oral Solution, RETROVIR® (zidovudine) Tablets, Capsules, Syrup, and IV Infusion, EPZICOM® (abacavir sulfate and lamivudine) Tablets, or TRIZIVIR® (abacavir sulfate, lamivudine, and zidovudine) Tablets; or emtricitabine-containing products, including ATRIPLA® (efavirenz, emtricitabine, and tenofovir), EMTRIVA® (emtricitabine), or TRUVADA® (emtricitabine and tenofovir). In vitro studies have shown ribavirin can reduce the phosphorylation of pyrimidine nucleoside analogues such as lamivudine and zidovudine. Although no evidence of a pharmacokinetic or pharmacodynamic interaction (e.g., loss of HIV-1/HCV virologic suppression) was seen when ribavirin was coadministered with lamivudine or zidovudine in HIV-1/HCV co-infected patients [see Clinical Pharmacology (12.3)], hepatic decompensation (some fatal) has occurred in HIV-1/HCV co-infected patients receiving combination antiretroviral therapy for HIV-1 and interferon alfa with or without ribavirin. Patients receiving interferon alfa with or without ribavirin and lamivudine and zidovudine tablets should be closely monitored for treatment-associated toxicities, especially hepatic decompensation, neutropenia, and anemia. Discontinuation of lamivudine and zidovudine tablets should be considered as medically appropriate. Dose reduction or discontinuation of interferon alfa, ribavirin, or both should also be considered if worsening clinical toxicities are observed, including hepatic decompensation (e.g., Child-Pugh greater than 6) (see the complete prescribing information for interferon and ribavirin). Exacerbation of anemia has been reported in HIV-1/HCV co-infected patients receiving ribavirin and zidovudine. Coadministration of ribavirin and zidovudine is not advised. Lamivudine and zidovudine tablets should be used with caution in patients with a history of pancreatitis or other significant risk factors for the development of pancreatitis. Treatment with lamivudine and zidovudine tablets should be stopped immediately if clinical signs, symptoms, or laboratory abnormalities suggestive of pancreatitis occur [see Adverse Reactions (6.1)]. Immune reconstitution syndrome has been reported in patients treated with combination antiretroviral therapy, including lamivudine and zidovudine tablets. During the initial phase of combination antiretroviral treatment, patients whose immune systems respond may develop an inflammatory response to indolent or residual opportunistic infections (such as Mycobacterium avium infection, cytomegalovirus, Pneumocystis jirovecii pneumonia [PCP], or tuberculosis), which may necessitate further evaluation and treatment. Redistribution/accumulation of body fat including central obesity, dorsocervical fat enlargement (buffalo hump), peripheral wasting, facial wasting, breast enlargement, and â€œcushingoid appearanceâ€ have been observed in patients receiving antiretroviral therapy. The mechanism and long-term consequences of these events are currently unknown. A causal relationship has not been established. Symptomatic myopathy [see Boxed Warning, Warnings and Precautions (5.2)]. Lactic acidosis and hepatomegaly with steatosis [see Boxed Warning, Warnings and Precautions (5.3)]. Acute exacerbations of hepatitis B [see Boxed Warning, Warnings and Precautions (5.4)]. Pancreatitis [see Warnings and Precautions (5.7)]. Lamivudine Plus Zidovudine Administered As Separate Formulations: In 4 randomized, controlled trials of EPIVIR® (lamivudine) 300 mg per day plus RETROVIR® (zidovudine) 600 mg per day, the following selected adverse reactions and laboratory abnormalities were observed (see Tables 1 and 2). Pancreatitis was observed in 9 of the 2,613 adult patients (0.3%) who received EPIVIR® (lamivudine) in controlled clinical trials [see Warnings and Precautions (5.7)]. • Frequencies of these laboratory abnormalities were higher in patients with mild laboratory abnormalities at baseline. In addition to adverse reactions reported from clinical trials, the following reactions have been identified during post-approval use of EPIVIR® (lamivudine), RETROVIR® (zidovudine), and/or lamivudine and zidovudine tablets. Because they are reported voluntarily from a population of unknown size, estimates of frequency cannot be made. These events have been chosen for inclusion due to a combination of their seriousness, frequency of reporting, or potential causal connection to EPIVIR® (lamivudine), RETROVIR® (zidovudine), and/or lamivudine and zidovudine tablets. Hepatic and Pancreatic: Lactic acidosis and hepatic steatosis, pancreatitis, posttreatment exacerbation of hepatitis B [see Boxed Warning, Warnings and Precautions (5.3), (5.4), (5.7)]. No drug interaction studies have been conducted using lamivudine and zidovudine tablets [see Clinical Pharmacology (12.3)]. Lamivudine: Zalcitabine: Lamivudine and zalcitabine may inhibit the intracellular phosphorylation of one another. Therefore, use of lamivudine and zidovudine tablets in combination with zalcitabine is not recommended. Zidovudine: Stavudine: Concomitant use of lamivudine and zidovudine tablets with stavudine should be avoided since an antagonistic relationship with zidovudine has been demonstrated invitro. Nucleoside Analogues Affecting DNA Replication: Some nucleoside analogues affecting DNA replication, such as ribavirin, antagonize the in vitro antiviral activity of zidovudine against HIV-1; concomitant use of such drugs should be avoided. Zidovudine: Concomitant use of lamivudine and zidovudine tablets with doxorubicin should be avoided since an antagonistic relationship with zidovudine has been demonstrated in vitro. Zidovudine: Coadministration of ganciclovir, interferon alfa, ribavirin, and other bone marrow suppressive or cytotoxic agents may increase the hematologic toxicity of zidovudine. Lamivudine: Although no evidence of a pharmacokinetic or pharmacodynamic interaction (e.g., loss of HIV-1/HCV virologic suppression) was seen when ribavirin was coadministered with lamivudine in HIV-1/HCV co-infected patients, hepatic decompensation (some fatal) has occurred in HIV-1/HCV co-infected patients receiving combination antiretroviral therapy for HIV-1 and interferon alfa with or without ribavirin [see Warnings and Precautions (5.5), Clinical Pharmacology (12.3)]. Lamivudine: No change in dose of either drug is recommended. There is no information regarding the effect on lamivudine pharmacokinetics of higher doses of TMP/SMX such as those used to treat PCP. Fetal Risk Summary: There are no adequate and well-controlled studies of lamivudine and zidovudine in pregnant women. Clinical trial data demonstrate that maternal zidovudine treatment during pregnancy reduces vertical transmission of HIV-1 infection to the fetus. Animal reproduction studies performed with lamivudine and zidovudine showed increased embryotoxicity and fetal malformations (zidovudine), and increased embryolethality (lamivudine). Lamivudine and zidovudine tablets should be used during pregnancy only if the potential benefit justifies the potential risk to the fetus. Antiretroviral Pregnancy Registry: To monitor maternal-fetal outcomes of pregnant women exposed to lamivudine and zidovudine and other antiretroviral agents, an Antiretroviral Pregnancy Registry has been established. Physicians are encouraged to register patients by calling 1-800-258-4263. Clinical Considerations: Treatment of HIV during pregnancy optimizes the health of both mother and fetus. Clinical trial data reviewed by FDA demonstrate that maternal zidovudine treatment significantly reduces vertical transmission of HIV-1 infection to the fetus [see Clinical Studies (14.2)]. Published data suggest that combination antiretroviral regimens may reduce the rate of vertical transmission even further. Pharmacokinetics of lamivudine and zidovudine in pregnant women are similar to the pharmacokinetics in nonpregnant women. No dose adjustments are needed during pregnancy. In a clinical trial, adverse events among HIV-1-infected women were not different among untreated women and women treated with zidovudine. It is not known whether risks of adverse events associated with lamivudine are altered in pregnant women compared with other HIV-1-infected patients (see Human data below). Data: Human Data:Lamivudine: Lamivudine pharmacokinetics were studied in pregnant women during 2 clinical studies conducted in South Africa. The study assessed pharmacokinetics in: 16 women at 36 weeks gestation using 150 mg lamivudine twice daily with zidovudine, 10 women at 38 weeks gestation using 150 mg lamivudine twice daily with zidovudine, and 10 women at 38 weeks gestation using lamivudine 300 mg twice daily without other antiretrovirals. Lamivudine pharmacokinetics in pregnant women were similar to those seen in nonpregnant adults and in postpartum women. Lamivudine concentrations were generally similar in maternal, neonatal, and umbilical cord serum samples. Zidovudine: A randomized, double-blind, placebo-controlled trial was conducted in HIV-1-infected pregnant women to determine the utility of zidovudine for the prevention of maternal-fetal HIV-1 transmission. Zidovudine treatment during pregnancy reduced the rate of maternal-fetal HIV-1 transmission from 24.9% for infants born to placebo-treated mothers to 7.8% for infants born to mothers treated with zidovudine. There were no differences in pregnancy-related adverse events between the treatment groups. Congenital abnormalities occurred with similar frequency between neonates born to mothers who received zidovudine and neonates born to mothers who received placebo. The observed abnormalities included problems in embryogenesis (prior to 14 weeks) or were recognized on ultrasound before or immediately after initiation of study drug [see Clinical Studies (14.2)]. Zidovudine pharmacokinetics were studied in a Phase 1 study of 8 women during the last trimester of pregnancy. As pregnancy progressed, there was no evidence of drug accumulation. The pharmacokinetics of zidovudine were similar to that of nonpregnant adults. Consistent with passive transmission of the drug across the placenta, zidovudine concentrations in neonatal plasma at birth were essentially equal to those in maternal plasma at delivery. Animal Data: Lamivudine: Animal reproduction studies performed at oral doses up to 130 and 60 times the adult dose in rats and rabbits, respectively, revealed no evidence of teratogenicity due to lamivudine. Increased early embryolethality occurred in rabbits at exposure levels similar to those in humans. However, there was no indication of this effect in rats at exposure levels up to 35 times those in humans. Based on animal studies, lamivudine crosses the placenta and is transferred to the fetus [see Nonclinical Toxicology (13.2)]. Zidovudine: Increased fetal resorptions occurred in pregnant rats and rabbits treated with doses of zidovudine that produced drug plasma concentrations 66 to 226 times (rats) and 12 to 87 times (rabbits) the mean steady-state peak human plasma concentration following a single 100 mg dose of zidovudine. There were no other reported developmental anomalies. In another developmental toxicity study, pregnant rats received zidovudine up to near-lethal doses that produced peak plasma concentrations 350 times peak human plasma concentrations (300 times the daily exposure [AUC] in humans given 600 mg/day zidovudine). This dose was associated with marked maternal toxicity and an increased incidence of fetal malformations. However, there were no signs of teratogenicity at doses up to one fifth the lethal dose [see Nonclinical Toxicology (13.2)]. The Centers for Disease Control and Prevention recommend that HIV-1-infected mothers in the United States not breastfeed their infants to avoid risking postnatal transmission of HIV-1 infection. Because of both the potential for HIV-1 transmission and serious adverse reactions in nursing infants, mothers should be instructed not to breastfeed if they are receiving lamivudine and zidovudine tablets. Although no studies of lamivudine and zidovudine excretion in breast milk have been performed, lactation studies performed with lamivudine and zidovudine show that both drugs are excreted in human breast milk. Samples of breast milk obtained from 20 mothers receiving lamivudine monotherapy (300 mg twice daily) or combination therapy (150 mg lamivudine twice daily and 300 mg zidovudine twice daily) had measurable concentrations of lamivudine. In another study, after administration of a single dose of 200 mg zidovudine to 13 HIV-1-infected women, the mean concentration of zidovudine was similar in human milk and serum. Lamivudine and zidovudine tablets should not be administered to pediatric patients weighing less than 30 kg, because they are a fixed-dose combination that cannot be adjusted for this patient population. Clinical studies of lamivudine and zidovudine did not include sufficient numbers of subjects aged 65 and over to determine whether they respond differently from younger subjects. In general, dose selection for an elderly patient should be cautious, reflecting the greater frequency of decreased hepatic, renal, or cardiac function, and of concomitant disease or other drug therapy. Lamivudine and zidovudine tablets are not recommended for patients with impaired renal function (i.e., creatinine clearance less than 50 mL/min) because they are a fixed-dose combination that cannot be adjusted. Reduction of the dosages of lamivudine and zidovudine is recommended for patients with impaired renal function. Patients with creatinine clearance less than 50 mL/min should not receive lamivudine and zidovudine tablets because they are a fixed-dose combination that cannot be adjusted. A reduction in the daily dose of zidovudine may be necessary in patients with mild to moderate impaired hepatic function or liver cirrhosis. Lamivudine and zidovudine tablets are not recommended for patients with impaired hepatic function because they are a fixed-dose combination that cannot be adjusted. Lamivudine and zidovudine tablets: There is no known antidote for lamivudine and zidovudine tablets. Lamivudine: One case of an adult ingesting 6 grams of lamivudine was reported; there were no clinical signs or symptoms noted and hematologic tests remained normal. Because a negligible amount of lamivudine was removed via (4 hour) hemodialysis, continuous ambulatory peritoneal dialysis, and automated peritoneal dialysis, it is not known if continuous hemodialysis would provide clinical benefit in a lamivudine overdose event. Zidovudine: Acute overdoses of zidovudine have been reported in pediatric patients and adults. These involved exposures up to 50 grams. The only consistent findings were nausea and vomiting. Other reported occurrences included headache, dizziness, drowsiness, lethargy, confusion, and 1 report of a grand mal seizure. Hematologic changes were transient. All patients recovered. Hemodialysis and peritoneal dialysis appear to have a negligible effect on the removal of zidovudine, while elimination of its primary metabolite, 3'-azido-3'-deoxy-5'- O-ß-D-glucopyranuronosylthymidine (GZDV), is enhanced. Lamivudine and zidovudine tablets USP are combination tablets containing lamivudine and zidovudine. Lamivudine (EPIVIR®) and zidovudine (RETROVIR®, azidothymidine, AZT, or ZDV) are synthetic nucleoside analogues with activity against HIV-1. Lamivudine and zidovudine tablets USP are for oral administration. Each film-coated tablet contains 150 mg of lamivudine, 300 mg of zidovudine, and the inactive ingredients hypromellose, magnesium stearate, microcrystalline cellulose, polyethylene glycol, polysorbate 80, sodium starch glycolate, and titanium dioxide. Lamivudine is a white to off-white solid with a solubility of approximately 70 mg/mL in water at 20°C. Zidovudine is a white to yellowish powder sparingly soluble in water and freely soluble in alcohol. Lamivudine and zidovudine tablets are an antiviral agent [see Clinical Pharmacology (12.4)]. Pharmacokinetics in Adults: Lamivudine and zidovudine tablets: One lamivudine and zidovudine tablet was bioequivalent to 1 EPIVIR® (lamivudine) Tablet (150 mg) plus 1 RETROVIR® (zidovudine) Tablet (300 mg) following single-dose administration to fasting healthy subjects (n = 24). Lamivudine: The pharmacokinetic properties of lamivudine in fasting patients are summarized in Table 3. Following oral administration, lamivudine is rapidly absorbed and extensively distributed. Binding to plasma protein is low. Approximately 70% of an intravenous dose of lamivudine is recovered as unchanged drug in the urine. Metabolism of lamivudine is a minor route of elimination. In humans, the only known metabolite is the trans-sulfoxide metabolite (approximately 5% of an oral dose after 12 hours). Zidovudine: The pharmacokinetic properties of zidovudine in fasting patients are summarized in Table 3. Following oral administration, zidovudine is rapidly absorbed and extensively distributed. Binding to plasma protein is low. Zidovudine is eliminated primarily by hepatic metabolism. The major metabolite of zidovudine is GZDV. GZDV area under the curve (AUC) is about 3 fold greater than the zidovudine AUC. Urinary recovery of zidovudine and GZDV accounts for 14% and 74% of the dose following oral administration, respectively. A second metabolite, 3â€²-amino-3â€²-deoxythymidine (AMT), has been identified in plasma. The AMT AUC was one fifth of the zidovudine AUC. • Data presented as mean ± standard deviation except where noted. Effect of Food on Absorption of Lamivudine and Zidovudine Tablets: Lamivudine and zidovudine tablets may be administered with or without food. The lamivudine and zidovudine AUC following administration of lamivudine and zidovudine tablets with food was similar when compared to fasting healthy subjects (n = 24). Pregnancy: See Use in Specific Populations (8.1). Lamivudine and Zidovudine Tablets: No data are available. Zidovudine: Zidovudine pharmacokinetics has been studied in a Phase 1 study of 8 women during the last trimester of pregnancy. As pregnancy progressed, there was no evidence of drug accumulation. The pharmacokinetics of zidovudine was similar to that of nonpregnant adults. Consistent with passive transmission of the drug across the placenta, zidovudine concentrations in neonatal plasma at birth were essentially equal to those in maternal plasma at delivery. Although data are limited, methadone maintenance therapy in 5 pregnant women did not appear to alter zidovudine pharmacokinetics. In a nonpregnant adult population, a potential for interaction has been identified. Nursing Mothers: See Use in Specific Populations (8.3). Pediatric Patients: Lamivudine and zidovudine tablets should not be administered to pediatric patients weighing less than 30 kg. Geriatric Patients: The pharmacokinetics of lamivudine and zidovudine have not been studied in patients over 65 years of age. Gender: A pharmacokinetic study in healthy male (n = 12) and female (n = 12) subjects showed no gender differences in zidovudine AUCâˆž or lamivudine AUCâˆž normalized for body weight. Race: Lamivudine: There are no significant racial differences in lamivudine pharmacokinetics. Drug Interactions: See Drug Interactions (7). No drug interaction studies have been conducted using lamivudine and zidovudine tablets. However, Table 4 presents drug interaction information for the individual components of lamivudine and zidovudine tablets. Lamivudine Plus Zidovudine: No clinically significant alterations in lamivudine or zidovudine pharmacokinetics were observed in 12 asymptomatic HIV-1-infected adult patients given a single dose of zidovudine (200 mg) in combination with multiple doses of lamivudine (300 mg q 12 hr). • This table is not all inclusive. • Estimated range of percent difference. Note: ROUTINE DOSE MODIFICATION OF LAMIVUDINE AND ZIDOVUDINE IS NOT WARRANTED WITH COADMINISTRATION OF THE FOLLOWING DRUGS. Ribavirin: In vitro data indicate ribavirin reduces phosphorylation of lamivudine, stavudine, and zidovudine. However, no pharmacokinetic (e.g., plasma concentrations or intracellular triphosphorylated active metabolite concentrations) or pharmacodynamic (e.g., loss of HIV-1/HCV virologic suppression) interaction was observed when ribavirin and lamivudine (n = 18), stavudine (n = 10), or zidovudine (n = 6) were coadministered as part of a multi-drug regimen to HIV-1/HCV co-infected patients [see Warnings and Precautions (5.5)]. Mechanism of Action: Lamivudine: Intracellularly, lamivudine is phosphorylated to its active 5'-triphosphate metabolite, lamivudine triphosphate (3TC-TP). The principal mode of action of 3TC-TP is inhibition of reverse transcriptase (RT) via DNA chain termination after incorporation of the nucleotide analogue. 3TC-TP is a weak inhibitor of cellular DNA polymerases Î±, ß, and Î³. Zidovudine: Intracellularly, zidovudine is phosphorylated to its active 5'-triphosphate metabolite, zidovudine triphosphate (ZDV-TP). The principal mode of action of ZDV-TP is inhibition of RT via DNA chain termination after incorporation of the nucleotide analogue. ZDV-TP is a weak inhibitor of the cellular DNA polymerases Î± and Î³ and has been reported to be incorporated into the DNA of cells in culture. Antiviral Activity: Lamivudine Plus Zidovudine: In HIV-1-infected MT-4 cells, lamivudine in combination with zidovudine at various ratios exhibited synergistic antiretroviral activity. Lamivudine: The antiviral activity of lamivudine against HIV-1 was assessed in a number of cell lines (including monocytes and fresh human peripheral blood lymphocytes) using standard susceptibility assays. EC50 values (50% effective concentrations) were in the range of 0.003 to 15 Î¼M (1 Î¼M = 0.23 mcg/mL). HIV-1 from therapy-naive subjects with no amino acid substitutions associated with resistance gave median EC50 values of 0.429 Î¼M (range: 0.200 to 2.007 Î¼M) from Virco (n = 92 baseline samples from COL40263) and 2.35 Î¼M (1.37 to 3.68 Î¼M) from Monogram Biosciences (n = 135 baseline samples from ESS30009). The EC50 values of lamivudine against different HIV-1 clades (A-G) ranged from 0.001 to 0.120 Î¼M, and against HIV-2 isolates from 0.003 to 0.120 Î¼M in peripheral blood mononuclear cells. Ribavirin (50 Î¼M) decreased the anti-HIV-1 activity of lamivudine by 3.5 fold in MT-4 cells. Zidovudine: The antiviral activity of zidovudine against HIV-1 was assessed in a number of cell lines (including monocytes and fresh human peripheral blood lymphocytes). The EC50 and EC90 values for zidovudine were 0.01 to 0.49 Î¼M (1 Î¼M = 0.27 mcg/mL) and 0.1 to 9 Î¼M, respectively. HIV-1 from therapy-naive subjects with no amino acid substitutions associated with resistance gave median EC50 values of 0.011 Î¼M (range: 0.005 to 0.110 Î¼M) from Virco (n = 92 baseline samples from COL40263) and 0.0017 Î¼M (0.006 to 0.0340 Î¼M) from Monogram Biosciences (n = 135 baseline samples from ESS30009). The EC50 values of zidovudine against different HIV-1 clades (A-G) ranged from 0.00018 to 0.02 Î¼M, and against HIV-2 isolates from 0.00049 to 0.004 Î¼M. In cell culture drug combination studies, zidovudine demonstrates synergistic activity with the nucleoside reverse transcriptase inhibitors (NRTIs) abacavir, didanosine, lamivudine, and zalcitabine; the non-nucleoside reverse transcriptase inhibitors (NNRTIs) delavirdine and nevirapine; and the protease inhibitors (PIs) indinavir, nelfinavir, ritonavir, and saquinavir; and additive activity with interferon alfa. Ribavirin has been found to inhibit the phosphorylation of zidovudine in cell culture. Resistance: Lamivudine Plus Zidovudine Administered As Separate Formulations: In patients receiving lamivudine monotherapy or combination therapy with lamivudine plus zidovudine, HIV-1 isolates from most patients became phenotypically and genotypically resistant to lamivudine within 12 weeks. In some patients harboring zidovudine-resistant virus at baseline, phenotypic sensitivity to zidovudine was restored by 12 weeks of treatment with lamivudine and zidovudine. Combination therapy with lamivudine plus zidovudine delayed the emergence of amino acid substitutions conferring resistance to zidovudine. HIV-1 strains resistant to both lamivudine and zidovudine have been isolated from patients after prolonged lamivudine/zidovudine therapy. Dual resistance required the presence of multiple amino acid substitutions, the most essential of which may be G333E. The incidence of dual resistance and the duration of combination therapy required before dual resistance occurs are unknown. Lamivudine: Lamivudine-resistant isolates of HIV-1 have been selected in cell culture and have also been recovered from patients treated with lamivudine or lamivudine plus zidovudine. Genotypic analysis of isolates selected in cell culture and recovered from lamivudine-treated patients showed that the resistance was due to a specific amino acid substitution in the HIV-1 reverse transcriptase at codon 184 changing the methionine to either isoleucine or valine (M184V/I). Zidovudine: HIV-1 isolates with reduced susceptibility to zidovudine have been selected in cell culture and were also recovered from patients treated with zidovudine. Genotypic analyses of the isolates selected in cell culture and recovered from zidovudine-treated patients showed substitutions in the HIV-1 RT gene resulting in 6 amino acid substitutions (M41L, D67N, K70R, L210W, T215Y or F, and K219Q) that confer zidovudine resistance. In general, higher levels of resistance were associated with greater number of amino acid substitutions. Cross-Resistance: Cross-resistance has been observed among NRTIs. Lamivudine Plus Zidovudine: Cross-resistance between lamivudine and zidovudine has not been reported. In some patients treated with lamivudine alone or in combination with zidovudine, isolates have emerged with a substitution at codon 184, which confers resistance to lamivudine. Cross-resistance to abacavir, didanosine, tenofovir, and zalcitabine has been observed in some patients harboring lamivudine-resistant HIV-1 isolates. In some patients treated with zidovudine plus didanosine or zalcitabine, isolates resistant to multiple drugs, including lamivudine, have emerged (see under Zidovudine below). Lamivudine: See Lamivudine Plus Zidovudine (above). Zidovudine: In a study of 167 HIV-1-infected patients, isolates (n = 2) with multi-drug resistance to didanosine, lamivudine, stavudine, zalcitabine, and zidovudine were recovered from patients treated for â‰¥ 1 year with zidovudine plus didanosine or zidovudine plus zalcitabine. The pattern of resistance-associated amino acid substitutions with such combination therapies was different (A62V, V75I, F77L, F116Y, Q151M) from the pattern with zidovudine monotherapy, with the Q151M substitution being most commonly associated with multi-drug resistance. The substitution at codon 151 in combination with substitutions at 62, 75, 77, and 116 results in a virus with reduced susceptibility to didanosine, lamivudine, stavudine, zalcitabine, and zidovudine. Thymidine analogue mutations (TAMs) are selected by zidovudine and confer cross-resistance to abacavir, didanosine, stavudine, tenofovir, and zalcitabine. Carcinogenicity: Lamivudine: Long-term carcinogenicity studies with lamivudine in mice and rats showed no evidence of carcinogenic potential at exposures up to 10 times (mice) and 58 times (rats) those observed in humans at the recommended therapeutic dose for HIV-1 infection. 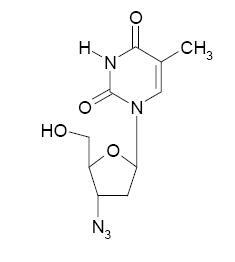 Zidovudine: Zidovudine was administered orally at 3 dosage levels to separate groups of mice and rats (60 females and 60 males in each group). Initial single daily doses were 30, 60, and 120 mg/kg/day in mice and 80, 220, and 600 mg/kg/day in rats. The doses in mice were reduced to 20, 30, and 40 mg/kg/day after day 90 because of treatment-related anemia, whereas in rats only the high dose was reduced to 450 mg/kg/day on day 91 and then to 300 mg/kg/day on day 279. Mutagenicity: Lamivudine: Lamivudine was mutagenic in an L5178Y/TK+/- mouse lymphoma assay and clastogenic in a cytogenetic assay using cultured human lymphocytes. Lamivudine was negative in a microbial mutagenicity assay, in an in vitro cell transformation assay, in a rat micronucleus test, in a rat bone marrow cytogenetic assay, and in an assay for unscheduled DNA synthesis in rat liver. Zidovudine: Zidovudine was mutagenic in an L5178Y/TK+/- mouse lymphoma assay, positive in an in vitro cell transformation assay, clastogenic in a cytogenetic assay using cultured human lymphocytes, and positive in mouse and rat micronucleus tests after repeated doses. It was negative in a cytogenetic study in rats given a single dose. Impairment of Fertility:Lamivudine: In a study of reproductive performance, lamivudine, administered to male and female rats at doses up to 130 times the usual adult dose based on body surface area considerations, revealed no evidence of impaired fertility (judged by conception rates) and no effect on the survival, growth, and development to weaning of the offspring. Zidovudine: Zidovudine, administered to male and female rats at doses up to 7 times the usual adult dose based on body surface area considerations, had no effect on fertility judged by conception rates. Lamivudine: Reproduction studies have been performed in rats and rabbits at orally administered doses up to 4,000 mg/kg/day and 1,000 mg/kg/day, respectively, producing plasma levels up to approximately 35 times that for the adult HIV dose. No evidence of teratogenicity due to lamivudine was observed. Evidence of early embryolethality was seen in the rabbit at exposure levels similar to those observed in humans, but there was no indication of this effect in the rat at exposure levels up to 35 times those in humans. Studies in pregnant rats and rabbits showed that lamivudine is transferred to the fetus through the placenta. Zidovudine: Oral teratology studies in the rat and in the rabbit at doses up to 500 mg/kg/day revealed no evidence of teratogenicity with zidovudine. Zidovudine treatment resulted in embryo/fetal toxicity as evidenced by an increase in the incidence of fetal resorptions in rats given 150 or 450 mg/kg/day and rabbits given 500 mg/kg/day. The doses used in the teratology studies resulted in peak zidovudine plasma concentrations (after one half of the daily dose) in rats 66 to 226 times, and in rabbits 12 to 87 times, mean steady-state peak human plasma concentrations (after one sixth of the daily dose) achieved with the recommended daily dose (100 mg every 4 hours). In an in vitro experiment with fertilized mouse oocytes, zidovudine exposure resulted in a dose-dependent reduction in blastocyst formation. In an additional teratology study in rats, a dose of 3,000 mg/kg/day (very near the oral median lethal dose in rats of 3,683 mg/kg) caused marked maternal toxicity and an increase in the incidence of fetal malformations. This dose resulted in peak zidovudine plasma concentrations 350 times peak human plasma concentrations. (Estimated AUC in rats at this dose level was 300 times the daily AUC in humans given 600 mg/day.) No evidence of teratogenicity was seen in this experiment at doses of 600 mg/kg/day or less. There have been no clinical trials conducted with lamivudine and zidovudine tablets. See Clinical Pharmacology (12.3) for information about bioequivalence. One lamivudine and zidovudine tablet given twice daily is an alternative regimen to EPIVIR® (lamivudine) Tablets 150 mg twice daily plus RETROVIR® (zidovudine) Tablets 600 mg per day in divided doses. Lamivudine Plus Zidovudine: The NUCB3007 (CAESAR) study was conducted using EPIVIR® (lamivudine) 150 mg Tablets (150 mg twice daily) and RETROVIR® (zidovudine) 100 mg Capsules (2 x 100 mg 3 times daily). CAESAR was a multi-center, double-blind, placebo-controlled study comparing continued current therapy (zidovudine alone [62% of patients] or zidovudine with didanosine or zalcitabine [38% of patients]) to the addition of EPIVIR® (lamivudine) or EPIVIR® (lamivudine) plus an investigational non-nucleoside reverse transcriptase inhibitor, randomized 1:2:1. A total of 1,816 HIV-1-infected adults with 25 to 250 (median 122) CD4 cells/mm3 at baseline were enrolled: median age was 36 years, 87% were male, 84% were nucleoside-experienced, and 16% were therapy-naive. The median duration on study was 12 months. Results are summarized in Table 5. • An investigational non-nucleoside reverse transcriptase inhibitor not approved in the United States. The utility of zidovudine alone for the prevention of maternal-fetal HIV-1 transmission was demonstrated in a randomized, double-blind, placebo-controlled trial conducted in HIV-1-infected pregnant women with CD4+ cell counts of 200 to 1,818 cells/mm3 (median in the treated group: 560 cells/mm3) who had little or no previous exposure to zidovudine. Oral zidovudine was initiated between 14 and 34 weeks of gestation (median 11 weeks of therapy) followed by IV administration of zidovudine during labor and delivery. Following birth, neonates received oral zidovudine syrup for 6 weeks. The study showed a statistically significant difference in the incidence of HIV-1 infection in the neonates (based on viral culture from peripheral blood) between the group receiving zidovudine and the group receiving placebo. Of 363 neonates evaluated in the study, the estimated risk of HIV-1 infection was 7.8% in the group receiving zidovudine and 24.9% in the placebo group, a relative reduction in transmission risk of 68.7%. Zidovudine was well tolerated by mothers and infants. There was no difference in pregnancy-related adverse events between the treatment groups. 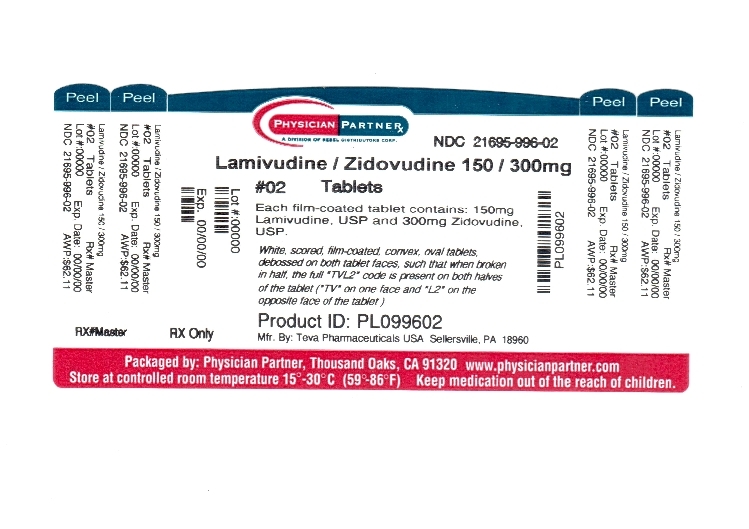 Lamivudine and zidovudine tablets USP, containing 150 mg lamivudine and 300 mg zidovudine, are available as white, scored, film-coated, convex, oval tablets, debossed on both tablet faces, such that when broken in half, the full "TVL2" code is present on both halves of the tablet ("TV" on one face and "L2" on the opposite face of the tablet) in bottles of 2. Neutropenia and Anemia: Patients should be informed that the important toxicities associated with zidovudine are neutropenia and/or anemia. They should be told of the extreme importance of having their blood counts followed closely while on therapy, especially for patients with advanced HIV-1 disease [see Warnings and Precautions (5.1)]. Co-infection With HIV-1 and HBV: Patients co-infected with HIV-1 and HBV should be informed that deterioration of liver disease has occurred in some cases when treatment with lamivudine was discontinued. Patients should be advised to discuss any changes in regimen with their physician [see Warnings and Precautions (5.4)]. Drug Interactions: Patients should be cautioned about the use of other medications, including ganciclovir, interferon alfa, and ribavirin, which may exacerbate the toxicity of zidovudine [see Drug Interactions (7.3)]. Redistribution/Accumulation of Body Fat: Patients should be informed that redistribution or accumulation of body fat may occur in patients receiving antiretroviral therapy and that the cause and long-term health effects of these conditions are not known at this time [see Warnings and Precautions (5.9)]. Information About Therapy With Lamivudine and Zidovudine Tablets: Lamivudine and zidovudine tablets are not a cure for HIV-1 infection and patients may continue to experience illnesses associated with HIV-1 infection, including opportunistic infections. Patients should be advised that the use of lamivudine and zidovudine tablets has not been shown to reduce the risk of transmission of HIV-1 to others through sexual contact or blood contamination. Patients should be advised of the importance of taking lamivudine and zidovudine tablets exactly as they are prescribed. Lamivudine and zidovudine tablets should not be coadministered with drugs containing lamivudine, zidovudine, or emtricitabine, including EPIVIR® (lamivudine), EPIVIR-HBV® (lamivudine), RETROVIR® (zidovudine), EPZICOM® (abacavir sulfate and lamivudine), TRIZIVIR® (abacavir sulfate, lamivudine, and zidovudine), ATRIPLA® (efavirenz, emtricitabine, and tenofovir), EMTRIVA® (emtricitabine), or TRUVADA® (emtricitabine and tenofovir) [see Warnings and Precautions (5.5)].